Download "Memorandum. Jeff Jasper, P.E. Director, Division of Design. Technical Support TEBM, Division of Construction. From: Jeremiah Littleton, P.E." 2 Special Note for CPM Scheduling A. General. Contrary to Kentucky Standard Specifications , additional contract time will only be added when the Engineer deems the critical path of the project has been effected. 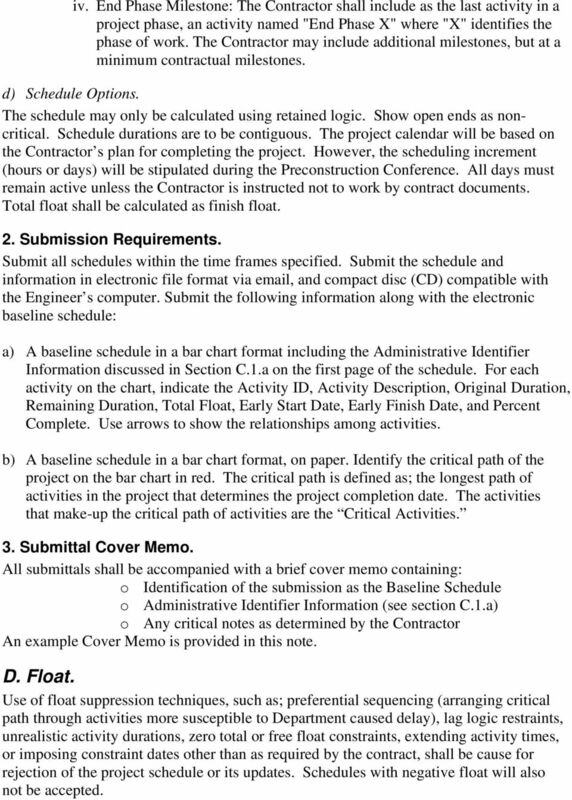 Create the progress schedule required for this project using the critical path method (CPM). The Contractor shall designate a Schedule Representative who shall be responsible for coordinating with the Engineer during the preparation and maintenance of the schedule. The contractor shall submit an interim schedule followed by a baseline schedule, or only a baseline schedule, depending on when the contractor starts work as described below. B. Interim Schedule. If the Contractor starts work within 15 days of the Notice to Begin Work, they shall submit an interim schedule. The interim schedule will be in CPM schedule format. The interim schedule shall include detailed activities for the work to be accomplished during the first 30 days of the Contract, and summary activities for the balance of the work. The interim schedule, if required, shall be submitted at the Preconstruction Conference. No work shall begin without the submission of an interim schedule. C. Baseline Schedule. The Contractor shall submit a baseline schedule as outlined in the submission requirements section (C.2) within 15 days of the Notice to Begin Work. No pay estimates will be processed after 15 days without the submission of the baseline schedule. The baseline schedule will be in CPM schedule format and as described below. The Engineer will review the baseline schedule and will accept, accept as noted or reject" the schedule within 5 days of receipt. If the Engineer does not provide written notification regarding the disposition of the baseline schedule within 5 days, the submission will be considered accepted. For baseline schedules that are accepted as noted, the Contractor shall make the necessary revisions and resubmit the revised schedule within 3 days. 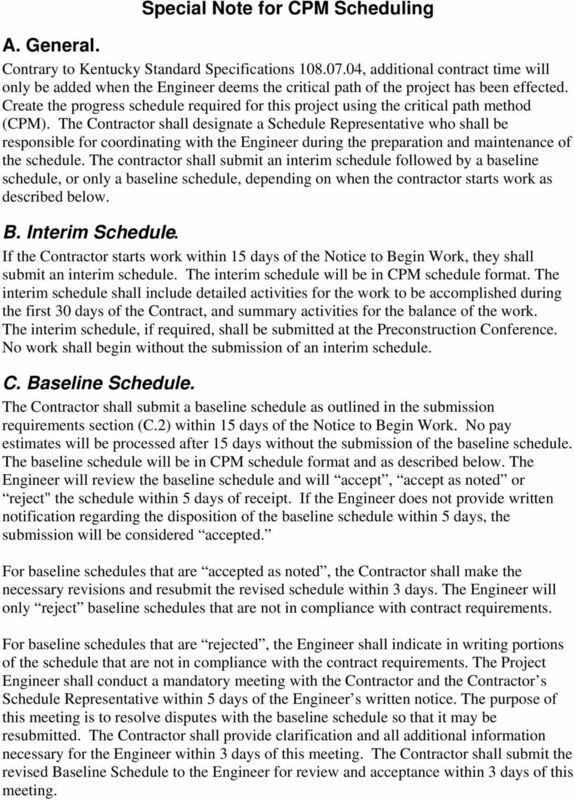 The Engineer will only reject baseline schedules that are not in compliance with contract requirements. For baseline schedules that are rejected, the Engineer shall indicate in writing portions of the schedule that are not in compliance with the contract requirements. The Project Engineer shall conduct a mandatory meeting with the Contractor and the Contractor s Schedule Representative within 5 days of the Engineer s written notice. The purpose of this meeting is to resolve disputes with the baseline schedule so that it may be resubmitted. The Contractor shall provide clarification and all additional information necessary for the Engineer within 3 days of this meeting. The Contractor shall submit the revised Baseline Schedule to the Engineer for review and acceptance within 3 days of this meeting. 3 No pay estimates will be generated until the baseline schedule is accepted or accepted as noted. In the event the baseline schedule is not accepted within 90 days of the Notice to Begin Work, all work shall cease on the project until the baseline schedule is accepted. The incurred delays from the cease work order will be the contractor s responsibility and will not be considered for time extension. Any claims associated with time impacts for work performed or delay experienced prior to the baseline schedule being accepted or accepted as noted will be evaluated at the sole discretion of the Engineer. Acceptance by the Engineer will not relieve the Contractor of their responsibilities for compliance with specifications and contract requirements or for the accuracy or feasibility of the schedule. Acceptance of the baseline schedule does not revise the Contract Documents. 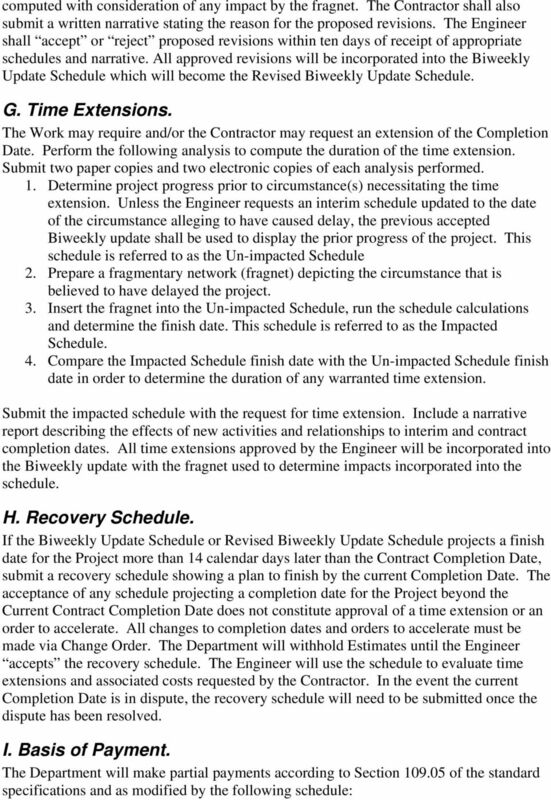 The baseline schedule must be accepted or accepted as noted by the Engineer prior to the Engineer evaluating any contractor claims associated with time impacts. The Engineer s review of the baseline schedule will be for compliance with the specifications and contract requirements. Acceptance by the Engineer will not relieve the Contractor of any of their responsibilities for the accuracy or feasibility of the schedule. 1. Schedule Requirements. 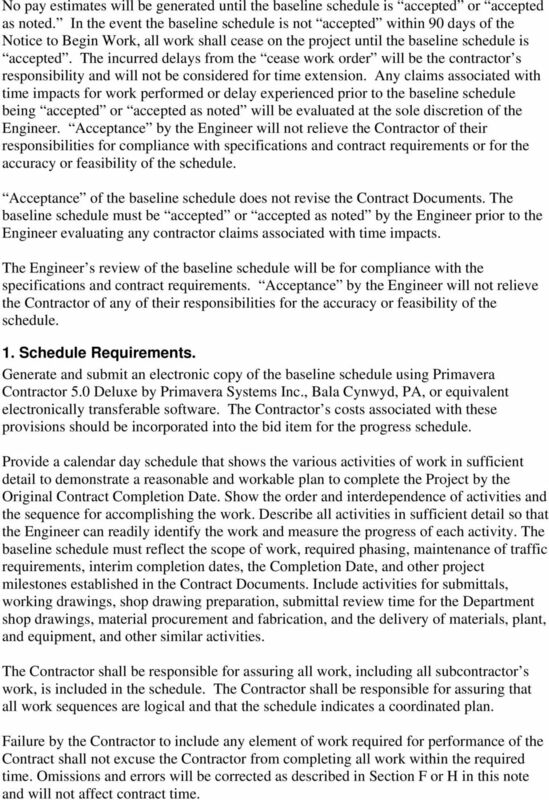 Generate and submit an electronic copy of the baseline schedule using Primavera Contractor 5.0 Deluxe by Primavera Systems Inc., Bala Cynwyd, PA, or equivalent electronically transferable software. The Contractor s costs associated with these provisions should be incorporated into the bid item for the progress schedule. Provide a calendar day schedule that shows the various activities of work in sufficient detail to demonstrate a reasonable and workable plan to complete the Project by the Original Contract Completion Date. Show the order and interdependence of activities and the sequence for accomplishing the work. Describe all activities in sufficient detail so that the Engineer can readily identify the work and measure the progress of each activity. The baseline schedule must reflect the scope of work, required phasing, maintenance of traffic requirements, interim completion dates, the Completion Date, and other project milestones established in the Contract Documents. Include activities for submittals, working drawings, shop drawing preparation, submittal review time for the Department shop drawings, material procurement and fabrication, and the delivery of materials, plant, and equipment, and other similar activities. The Contractor shall be responsible for assuring all work, including all subcontractor s work, is included in the schedule. The Contractor shall be responsible for assuring that all work sequences are logical and that the schedule indicates a coordinated plan. Failure by the Contractor to include any element of work required for performance of the Contract shall not excuse the Contractor from completing all work within the required time. Omissions and errors will be corrected as described in Section F or H in this note and will not affect contract time. 4 a) Administrative Identifier Information. 1. Project Number 2. County 3. Route Number 4. Item Number 5. CID Number 6. Award Date 7. Date of Notice to Begin Work 8. Completion Date 9. Contractor s Name 10. Contractor s Dated Signature 11. KYTC s Dated Accepted Signature b) Project Activities. i. Activity Identification (ID): Assign each activity a unique identification number. Activity ID length shall not exceed 10 characters. Assign baseline Activity ID s in sequences of 10 (e.g. ; A1000, A1010, A1020). This will allow modifications and additional items to be placed into the Identification scheme easily. Once accepted, the Activity ID shall be used for the duration of the project. ii. Activity Description: Each activity shall have a narrative description consisting of a verb or work function (e.g. ; form, pour, excavate, pier #2) and an object (e.g. ; slab, footing, underdrain). iii. Activity Original Duration: Assign planned duration in calendar days for each activity. Do not exceed a duration of 20 calendar days for any construction activity unless approved by the Engineer. Do not represent the maintenance of traffic, erosion control, and other similar items as single activities extending to the Completion Date. Break these Contract Items into component activities in order to meet the duration requirements of this paragraph. iv. Activity Relationships: All activities, except the first activity, shall have a predecessor(s). All activities, except the final activity, shall have a successor(s). Use only finish-to-start relationships with no leads or lags to link activities, or use start-to-start relationships with lags no greater than the predecessor duration to link activities. Use of finish-to-finish relationship is permitted when both activities are already linked with a start-to-start relationship. c) Project Milestones. i. Start Project: The Contractor shall include as the first milestone in the schedule, a milestone named Start Project. The date used for this milestone is the date the contract is executed and signed by the Department. ii. End Project Milestone: The Contractor shall include as the last activity in the project schedule, a milestone named End Project. The date used for this milestone is considered the project completion date. iii. Start Phase Milestone: The Contractor shall include as the first activity for a project phase, an activity named "Start Phase X", where "X" identifies the phase of work. The Contractor may include additional milestones but, as a minimum, must include all contractual milestones. 5 iv. 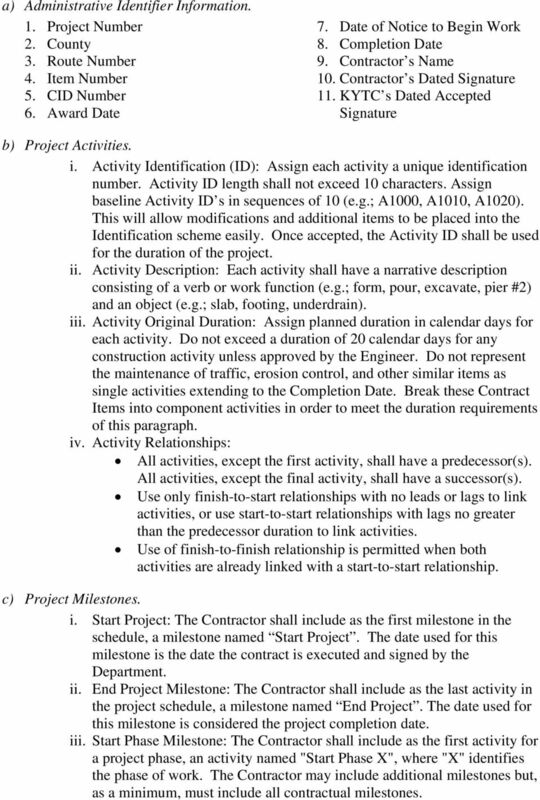 End Phase Milestone: The Contractor shall include as the last activity in a project phase, an activity named "End Phase X" where "X" identifies the phase of work. The Contractor may include additional milestones, but at a minimum contractual milestones. d) Schedule Options. The schedule may only be calculated using retained logic. Show open ends as noncritical. Schedule durations are to be contiguous. The project calendar will be based on the Contractor s plan for completing the project. However, the scheduling increment (hours or days) will be stipulated during the Preconstruction Conference. All days must remain active unless the Contractor is instructed not to work by contract documents. Total float shall be calculated as finish float. 2. Submission Requirements. Submit all schedules within the time frames specified. Submit the schedule and information in electronic file format via , and compact disc (CD) compatible with the Engineer s computer. Submit the following information along with the electronic baseline schedule: a) A baseline schedule in a bar chart format including the Administrative Identifier Information discussed in Section C.1.a on the first page of the schedule. For each activity on the chart, indicate the Activity ID, Activity Description, Original Duration, Remaining Duration, Total Float, Early Start Date, Early Finish Date, and Percent Complete. Use arrows to show the relationships among activities. b) A baseline schedule in a bar chart format, on paper. Identify the critical path of the project on the bar chart in red. The critical path is defined as; the longest path of activities in the project that determines the project completion date. The activities that make-up the critical path of activities are the Critical Activities. 3. Submittal Cover Memo. 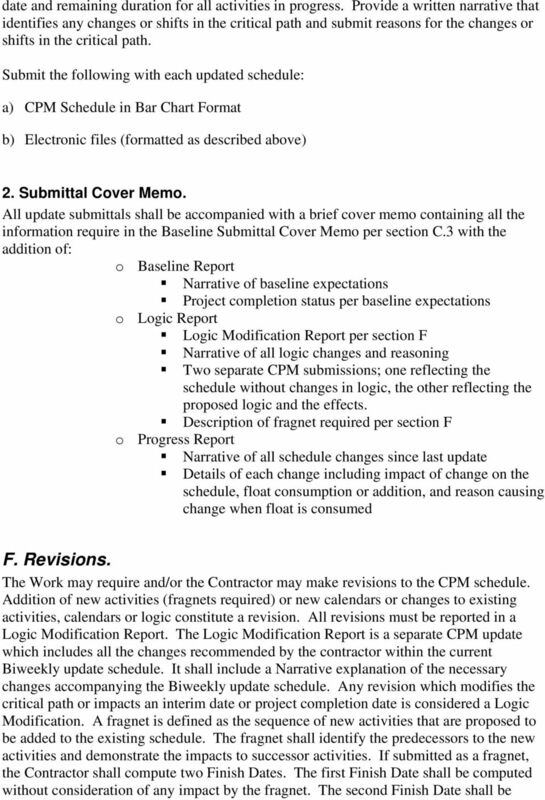 All submittals shall be accompanied with a brief cover memo containing: o Identification of the submission as the Baseline Schedule o Administrative Identifier Information (see section C.1.a) o Any critical notes as determined by the Contractor An example Cover Memo is provided in this note. D. Float. 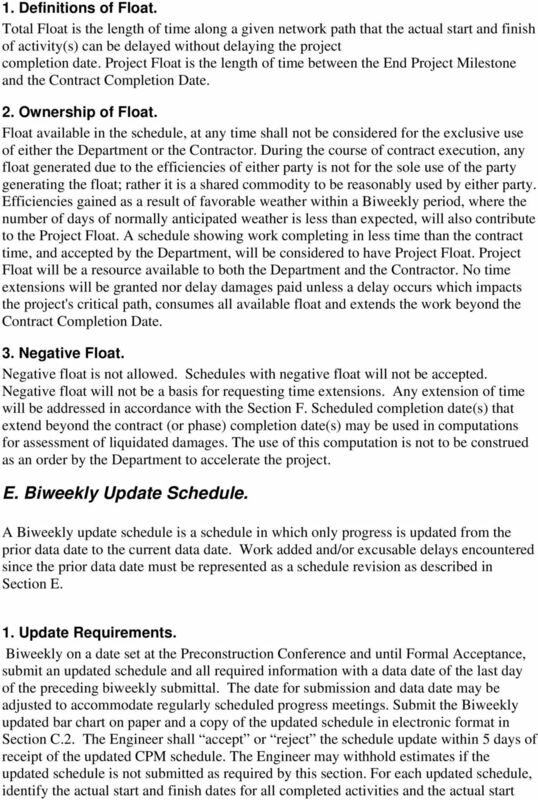 Use of float suppression techniques, such as; preferential sequencing (arranging critical path through activities more susceptible to Department caused delay), lag logic restraints, unrealistic activity durations, zero total or free float constraints, extending activity times, or imposing constraint dates other than as required by the contract, shall be cause for rejection of the project schedule or its updates. Schedules with negative float will also not be accepted. 9 1. 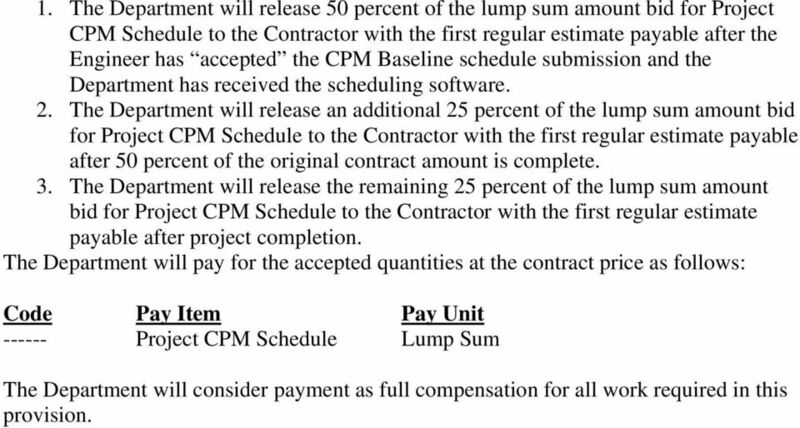 The Department will release 50 percent of the lump sum amount bid for Project CPM Schedule to the Contractor with the first regular estimate payable after the Engineer has accepted the CPM Baseline schedule submission and the Department has received the scheduling software. 2. The Department will release an additional 25 percent of the lump sum amount bid for Project CPM Schedule to the Contractor with the first regular estimate payable after 50 percent of the original contract amount is complete. 3. 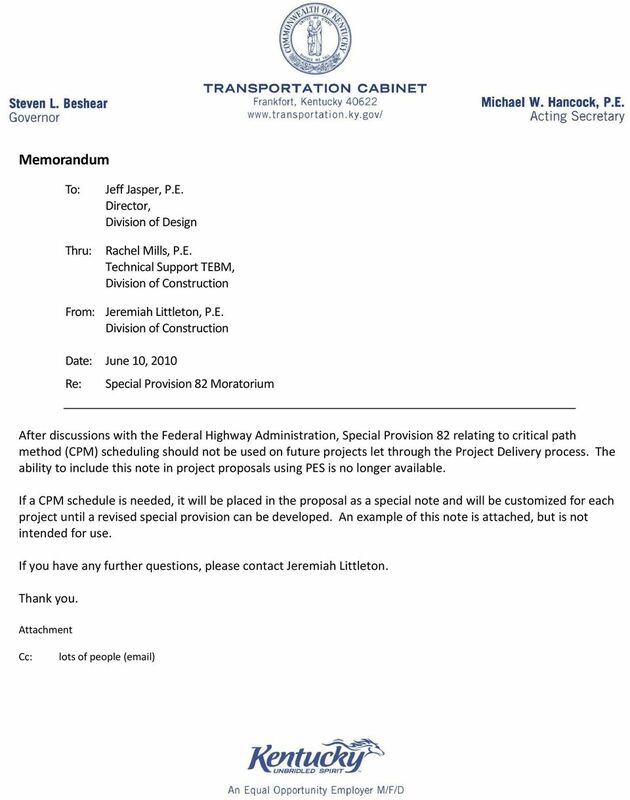 The Department will release the remaining 25 percent of the lump sum amount bid for Project CPM Schedule to the Contractor with the first regular estimate payable after project completion. The Department will pay for the accepted quantities at the contract price as follows: Code Pay Item Pay Unit Project CPM Schedule Lump Sum The Department will consider payment as full compensation for all work required in this provision. B. See Section Payment Procedures for submitting the Schedule of Values. Insert tasks in the same order as given in table 1 into the Gantt chart. LONG INTERNATIONAL Long International, Inc. 10029 Whistling Elk Drive Littleton, CO 80127-6109 (303) 972-2443 Fax: (303) 972-6980 www.long-intl.com Schedule and Delay Analysis Methodologies Richard J. LONG INTERNATIONAL Long International, Inc. 10029 Whistling Elk Drive Littleton, CO 80127-6109 (303) 972-2443 Fax: (303) 972-6980 www.long-intl.com Construction Claims Prevention Richard J. Long, P.E.